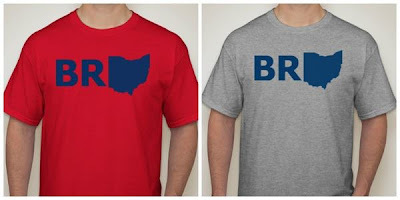 My version of the Brohio shirt can be yours for a little fee. It is safe to say I am a fan of the humble t-shirt. I especially fond of my Cleveland t-shirts. I think I have the entire collection by GVArtwork and Fresh Brewed Tees, with a few Rubber City Clothing shirts thrown in for good measure. The Indians' Nick Swisher, is about as Ohio as it gets. He loves to call everyone Bro, as in "Sup Bro?" and Brohio was born. Swisher, being the awesome guy he is, created some Brohio shirts for himself and friends and then started giving them out at games. You can get his version by purchasing an Indians ticket to sit in the "Brohio" section. I encourage you to do so. 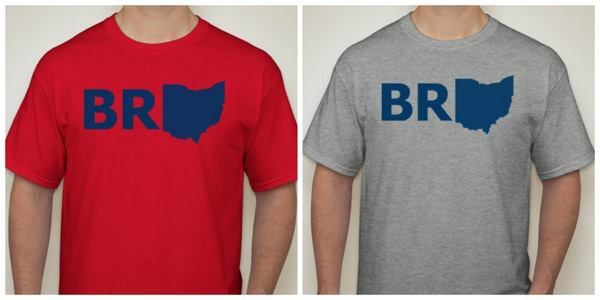 I'm selling my version of the Brohio shirt that I put together after entering the Indians Mayor of Brohio contest. $1 from each shirt will go to the Cleveland Foodbank and the rest will go to me taking my pops to Spring Training this year. The shirts are printed locally, in Brunswick. If you are interested, please share this with your friends, and if you aren't, no worries Bro. Brohio sign for the Tribe game showing my Bro-ness. Disclaimer: this is in no way shape or form associated with Nick Swisher, the Indians, or anything or anyone associated with the ballclub. Just my idea to raise some extra cheese for Spring Training.